Before the Magistrates' Court started recording proceedings following Practice Direction 1 of 1999, the Victorian Supreme Court considered a few cases about tape-recording court proceedings. The cases weren't definitive. Nguyen v Magistrates' Court of Victoria  1 VR 88 held that recording without the knowledge and permission of the presiding magistrate was a contempt of court. Later in Stefanovski v Murphy  2 VR 442, the Court of Appeal doubted that it was a contempt, but seemed to accept a magistrate could permit or refuse tape-recording under its general directions power in s 136 of the Magistrates' Court Act 1989. Still later in Tran v Magistrates’ Court of Victoria  4 VR 294 the Court of Appeal simply considered it was a discretionary decision for the presiding magistrate. Today, a visitor to a Magistrates' Court will see notices of an order issued by the Chief Magistrate prohibiting recording of proceedings using mobile phones. The direction doesn't seem to be a practice direction issued pursuant to s 16A of the Magistrates' Court Act, so presumably is founded on s 136. In Prothonotary of the Supreme Court of New South Wales v Rakete  NSWSC 665 the NSW Supreme Court sentenced Te Rana Rakete for filming with a digital camera a witness giving evidence in a trial, after finding him guilty of the offence in Prothonotary of the Supreme Court of New South Wales v Rakete  NSWSC 5. The contempt was established because filming without the Court's permission risked interfering with the administration of justice — in the sense that it could disrupt the court hearing and smooth and efficient running of the trial. There was no evidence in this case that the filming was to intimidate the witness who was recorded, or later use that recording for some form of retribution. I have already found that the defendant‘s conduct had the tendency to interfere with the administration of justice, in terms of potentially interrupting the concentration and focus of jurors and diverting their attention from their task:  NSWSC 5 at . I also found that the activities of an unknown person seeking to record the evidence of a witness also had the tendency to interfere with the administration of justice in terms of at least distracting, if not actually frightening and intimidating, a witness of the presumed fortitude of Mr Campton, let alone a hypothetical witness of “ordinary” fortitude: . The plaintiff has quite properly conceded that the seriousness of the contempt was not aggravated by any evidence that showed that the witness or any juror in fact saw the defendant using the camera or that he or she was in fact distracted, frightened or intimidated by what occurred: Prothonotary of the Supreme Court of New South Wales v Rakete  NSWSC 665 at . 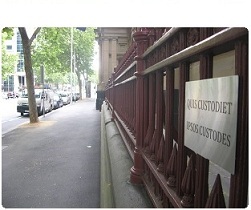 It seems no matter what the legal foundation is for the standing order in Victoria's Magistrates' Court prohibiting recording proceedings, the common law criminalises that conduct and justifies prominent warnings in the Court's precincts. The NSW arguments that filming a witness may interfere with the 'administration of justice' are revealing in how weak they are. How does filming 'distract' or 'intimidate' anyone, exactly? Is it OK if you conceal the camera in your hat? How is any of this different to just sitting in court? Even more so, how is Victoria's blanket ban on filming 'conducive to [a proceeding's] effective, complete, prompt and economical determination'? It's just an excuse to avoid scrutiny, isn't it? Or just magistrates wanting to make sure that everyone respects their authoritah. In light of the much more stringent protections for open justice in s126, I'd query whether using s136, especially in a blanket way, is compatible with Charter s. 24(2). I agree. Why would it disrupt court proceedings to record a court hearing when everybody knows it gets recorded anyway? 'Digital contempt'. Wouldn't that be giving someone the finger? I suspect that courts are more concerned about the use that unauthorised recordings might be put to, rather than the simple act of recording itself. While there are various mechanisms to prevent inappropriate distribution of that kind of material (privacy, defamation, anti-surveillance provisions, to name a few) perhaps the simplest means is just to ensure it's not recorded in the first place. Although I can't furnish any proof of this, it's understandable that some parties to a proceeding (and by that I mean witnesses, the accused, etc.) take some comfort from the fact that their matter is only being recorded for official purposes. I have no doubt whatsoever that some parties to proceedings take 'comfort' from the apparent privacy of proceedings that supposedly occur in open court. I used to send my criminal law students to watch magistrates' court proceedings and was shocked when some lawyers asked them to leave because their clients (facing traffic charges) didn't like uninvolved people observing. Now, that's an interference with the effective and complete determination of the proceedings, not to mention a contempt of court. It would, of course, be simpler to just lock the doors.